Alban Low is involved in a variety of projects including album artwork, publishing chapbooks, making films, live performances and his own drawing, and he is artist in residence at the School of Nursing. He spends his evenings in the jazz clubs of London, where he captures the exhilaration of live performance in his sketchbook. Kevin Acott divides his time between writing, photography and collaborative projects. His stories and poems can be found on the websites Sad Paradise, ​Londonist, Smoke: A London Peculiar, and Ink Sweat and Tears. Through acute observation of the urban environment, Steve's work across photography, drawing and artist books sets up uneasy relationships between structures, the spaces in between and the people that inhabit them. The work is informed on the one hand by a fascination with the architecture of the 1960s and 1970s, how it has survived and sits now in a changing landscape. On another level Steve is interested in 'somewhere between contemplation and noise lies the psychological territory I know as Side Country. It's physical location is similarly liminal: behind the shed, between paving slabs, round the outskirts of our towns and cities, under the white bits on our maps'. Steve has exhibited extensively, including solo shows, Miss Read at the Berlin Book Festival with AMBruno in July 2017, and ​Show and Tell with AMBruno at Tate Britain. An interest in the environment informs Barbara's work, along with an ongoing exploration of constraint, change and adaptation. For two years she collaborated with choreographer Darren Ellis and dancer Hannah Kidd, leading to films Tea Break and Living Room, and a participatory work Unentitled: channel your angst in the Edwardian Cloakrooms in Bristol in 2016. This project overlapped with a series of films, resulting from a collusion of art and experiential geography. The current series focuses on water, reflecting on everyday immersions in a world of affective resonances, and how the body comprehends the sensations it is open to at all moments. Through selective film and sound recording and editing, the work aims to transfer an intensely subjective exploration of an environment as an embodied experience for others. Watch Guidecca on Vimeo. For more information visit the artist's website. Anne is fascinated by the urban environment, the grids and textures that make up contemporary cities and that structure and shape our lives. I investigate the visual language of place; the material and shape we choose to surround ourselves with, translating the materiality of spaces into a series of collages, sculptural works and animated films. Collecting architectural surfaces, textures and shapes with camera and pencil, I deconstruct them and re-connect them, trying to make sense of the skins of buildings and what meaning they might carry. Anne has an MA from the Royal College of Art and Design. During 2016 she undertook a residency, titled Sites and Structures, at the Cultural Centre Tobacco in Ljubljana, Slovenia. The previous year she was awarded the Alexandra Reinhardt Memorial Residency and Commission and worked at The Bluecoat in Liverpool, working with two groups of participants towards a temporary public sculpture, We Approach. For more information visit the artist's website. Employing photography, film, digitally generated imagery, games design and sculpture, Henry's work is totally contemporary in it's exploration of the speed at which the digital and virtual worlds are developing and the serious issues and questions that this raises. He creates shifting and shimmering imagery that seduces the eye, the technical virtuosity always in service to his purpose and enwrapping the viewer. These are not works trapped in the confines of a monitor screen; excitingly, the scale, vehicle and installation of each is carefully tuned. In October 2015 Henry was the guest artist for Phantom, video, ​a Halloween event for Firstsite, which gave him the opportunity to show six works, ranging from a vast projection in the entrance to the three dimensional Videocube. ​Another work included, A Tender Vision (below) video, was the beginning of a new experimentation with real and virtual surface, which is a possible direction for Henry's research whilst working with grove. commission in Cambridge for some of the artists. Sarah Sabin’s work has been concerned for a number of years with 'digging about under the surface'. Her work involves researching particular locations and histories, both real and imagined. She uses methods and processes from archaeology and employs a range of two and three dimensional media. Making, and an engagement and experimentation with materials and methods are important in my work. I use a wide range of media to create objects and installations, or manipulate and reassemble found artefacts. I don't like to pin myself down to a particular material. Accompanies by drawing, collage and digital photography, my work often has multiple/repeated elements. An indication of Sarah's interests and ways of working comes from her residence at the Institute of Archaeology, University College London, in 2008, which ran concurrently with the development of the new building for firstsite in Colchester. In considering how best to commemorate the building of a new gallery on a scheduled ancient monument site, firstsite commissioned Sarah to respond. This prompted Sarah to apply archaeological methods to explore the site and the story of the infill, leading to the artworks and accompanying publication of gunpowder and gold. Whilst the direction that her research will take whilst working with grove is open at this stage, she is interested in the site of grove on a chalk pit, one of many old chalk workings in Bury St Edmunds. Lighthouses have always been magical places, especially for an island nation; often remote and beyond reach, monuments of the sea, they are made even more mythical by books, especially Virginia Woolf’s 1927 novel To the Lighthouse. Observed from inland they act as landmarks on the coast yet for their real purpose as beacons they have to be seen from the sea, usually by boat. Ruth Philo’s practice is painting and photography, concerned with abstract qualities relating to the everyday, time and place and their ability to convey sensation and feeling. Recent work looking at the sea, navigation and weather, and working from buoys and lightships in the Buoy Yard at Trinity House, Harwich, led her to explore the wilds of Orford Ness and the lighthouse there that is in danger of being lost to the sea and which has since been decommissioned. Ruth has been recording its interior since 2012, observing changes over time and the shifting perceptions of space altered entirely by weather and light, refracted through prisms to illuminate the stark inside. Ruth has been collaborating with sound artist Stuart Bowditch (listen here to location based work) to develop a digital film-sound piece, essentially a portrait, that tries to capture the essence of this space and its very particular sense of place before it is finally lost. Work from this collaboration was installed at grove in September 2015 and records can be seen at projects. Alison Carlier worked with grove during spring 2015, and was in residence for the week commencing 22 June, culminating in an event on Saturday 27 June 2015 to share emerging work. The residency and her work are documented in projects. Alison's practice is reflective on being an artist and she is particularly interested in drawing, as a way of being, seeing and understanding. 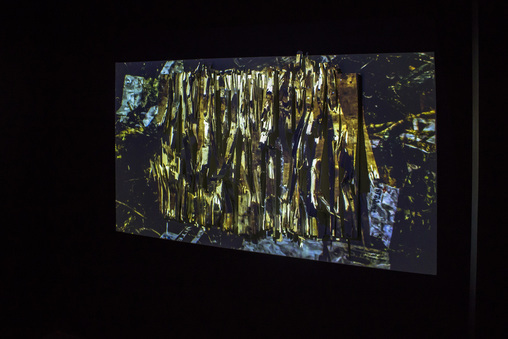 Her work embraces a range of drawing materials, film and sound. She is interested in the discourse around drawing, which she integrates into her work, as in The Drawing Attitude, 2013, which is a small publication comprising transcriptions of interviews with artists including Jordan Baseman and an email response from Tania Kovats, and an ongoing project. Elsewhere, Alison tasks the viewer with drawing in their imagination, her work providing the structure and stimulus. In Adjectives, Lines and Marks, 2013 the starting point is a piece of text whereas in the piece she submitted for the Jerwood Drawing Prize in 2014, the 'viewer' concentrates on a recording of the artist describing an object, which they evoke for themselves. This soundpiece, Adjectives, lines and marks, 2013, won the Jerwood Prize, the first sound work to do so.